Stress is defined as mechanical force per unit area applied to an object. As plants are sessile, it is difficult to measure the exact force exerted by stresses and therefore in biological terms it is difficult to define stress. A biological condition, which may be stress for one plant may be optimum for another plant. The most practical definition of a biological stress is an a..
A cell is separated from its surrounding environment by a physical barrier, which is the plasma membrane. This membrane is permeable to only some small lipid molecules such as steroid hormones, which can diffuse through the membrane into the cytoplasm and is impermeable to the water-soluble material including ions, proteins and other macromolecules. The cellular responses are initiated primarily by interaction of the extracellular material with a plasma membrane protein. This extracellular molecule is called a ligand (or an elicitor) and the plasma membrane protein, which binds and interacts with this molecule, is called a receptor. Signalling can be divided into three stages. 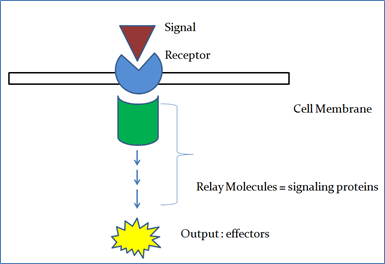 Response – Finally, the signal triggers a specific cellular response. It is the first step in a signal transduction pathway which is followed by generation of secondary signaling molecules which are generally non-protein molecules such as Ca2+, IPs (Inositol phosphates) and ROS (Reactive oxygen species). Each of the secondary signaling molecules is capable of initiating a protein phosphorylation cascade which can regulate the activity of specific TFs (Transcription factors). Because of plethora of stresses and their individual effects at the cellular level, it is easy to imagine the presence of sensors which can sense the stress (cold, drought, salinity) and specifically promote transduction of a particular stress signal to cellular targets. A typical two-component system consists of a membrane-localized HIK (Histidine Kinase) that senses the input signal and a Rres (Response regulator) that mediates the output signal. The transmembrane two-component histidine kinases HIK33 (Synechocystis) and DesK (B. subtilis) are the suggested examples of thermosensors. Budding yeast ( S. cerevisiar) undergoes rapid phosphorylation and activation of MAPK (Mitogeactivated protein kinase)-high-osmolarity HOG1 (Glycerol response 1) in response to high osmolarity. A. thaliana histidine kinase 1 (AtHK1) is also considered as a candidate osmosensor because of its increased expression under high salt and low temperature conditions. Oxygen is required for normal growth in plants which leads to the formation of ROS (reactive oxygen species) as a by-product of respiration and photosynthesis. Molecular O2 can be converted to superoxide anions by a single electron transfer which undergoes reductions to form H 2O2 and hydroxyl radicals. These three molecules are the ROS and cause oxidative damage to proteins, DNA and lipids. Stress conditions like drought and low and high temperatures can lead to activation of ROS resulting oxidative stress. In addition to this, H 2O2 is more likely to be a signaling molecule as it diffuses more easily through aqueous and lipid phases. It also activates MAPK3 and MAPK6 in Arabidopsis via ANP1 (a mitogen-activated protein kinase kinase kinase). ABA (Absisic acid) also induces H 2O2 production and therefore many ABA response processes are mediated by ROS productions that follow ABA signaling. Ca2+ is another non-protein molecule which is a key player in plant response to abiotic stresss. In the cytosol, a Ca2+ spike is generated and maintained by interplay between influx and efflux. Disturbed Ca2+ homeostasis by over expression of Ca2+ /H+ antiporter calcium exchanger 1 (CAX1) which loads Ca2+ into vacuoles, renders the plants hypersensitive to ionic and cold stress. ABA and mechanical stress signals mobilize Ca2+ from intracellular stores whereas the influx of extracellular Ca 2+ is a key component in transduction of low temperature stress signal. These are the integral part of plasma membrane can generate signaling molecules. Phosphorylated forms of phosphatidyl inositol (PI) constitute an important and complex group of signal precursors. The isomers of PI in plants such as PIP (phosphatidyl inositol phosphate) and PIP2 (phosphatidyl inositol bisphosphate) provide additional complexity during signaling. The degradation of phospholipids is mediated by PLC (phospholipase C) which produces IP3 (inositol 1,4,5-triphosphate) and DAG (diacylglycerol), which individually act as secondary messengers (Figure 2). Cellular levels of IP3 have a direct effect on ABA-induced gene expression. ABA induction of KIN1, RD29A and RD22 is delayed in plants overexpressing the enzyme (In5Pase) involved in IP3 catabolism. Calcium dependent protein kinases (CDPKs) are one of the largest subfamilies of plant protein kinases. It is having a hybrid structure of a Ca2+ sensor and a kinase thus a calmodulin-like domain and an N-terminal ser/thr protein kinase domain. It is having a significant role in signaling of abiotic stresses. MAP kinases are intermediates in signal transduction pathways that are initiated by many types of surface receptors. The targets of MAPK are located within many cellular compartments. MAPK provide a physical link in the signal transduction pathway from the cytoplasm to the nucleus. Each MAPK pathway contains a three tiered kinase cascade comprising a MAP kinase kinase kinase (MAPKKK, MAP3K, MEKK or MKKK), a MAP kinase kinase (MAPKK, MAP2K, MEK or MKK) and the MAPK. Plants have a cold acclimation mechanism which help them to survive in freezing temperature and this mechanism is induced by asset of genes known as COR (cold responsive) genes. One of the COR genes, COR78 (low temperature inducible) or RD29A (responsive to dehydration) are very important to study the gene regulation during cold and osmotic stress. The promoter region of RD29A is having a 9bp sequence, dehydration responsive element/C-repeat (DRE/CRT) which responses to low temperature, drought and salinity stress condition. The transcription factor, C-repeat binding factor 1 (CBF1) belongs to AP2/EREBP family of transcription factors. The ICE1 (inducer of CBF expression) activates the CBF genes. 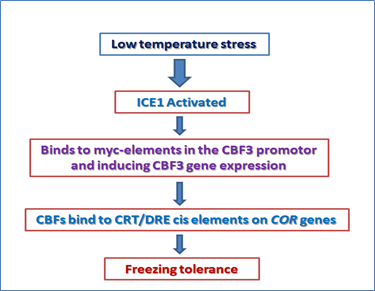 ICE1 is a constitutive transcription factor, which is activated upon the cold stress and binds to myc-elements in the CBF3 promoter and induces its expression. CBFs bind to the CRT/DRE cis-elements on COR genes and induces the gene expression leading to freezing tolerance (Figure 3). ABA is an important phytohormone plays a critical role in response to various stress signals. The application of ABA to plant mimics the effect of a stress condition. 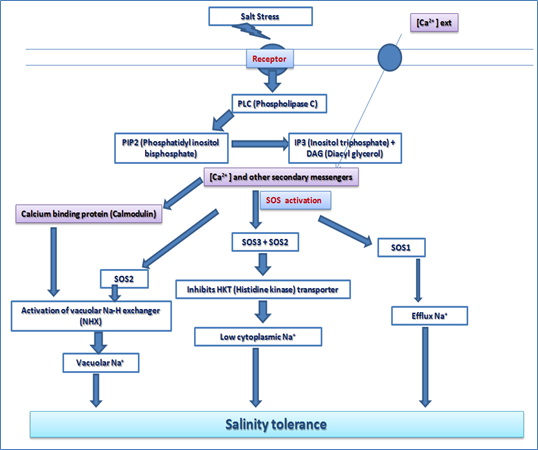 As many abiotic stresses ultimately results in desiccation of the cell and osmotic imbalance, there is an overlap in the expression pattern of stress genes after cold, drought, high salt or ABA application. ABA mediated gene expression can be explained by two types of pathways: ABA-dependent and independent signal transduction pathways in crop plants (Figure 4). The ABA-dependent regulons are (i) AREB/ABF and (ii) MYC/MYB. The ABA-independent regulons are (iii) CBF/DREB and (iv) NAC/ZF-HD. AREB/ABF Regulon (ABA-responseive element binding protein/ABA-binding factor) The AREB/ABF belongs to the bZIP (basic leucine zipper) transcription factor family which recognizes the ABRE motif there by activating ABA-dependent gene expression. MYC/MYB Regulon MYC/MYB TFs play important role in stress signalling by ABA-independent pathwayby up regulating the abiotic stress responsive genes. AtMYB2 and ATMYC2 together activate the RD22 gene expression. CBF/DREB Regulon (Cold-binding factor/dehydration –responsive element binding) CBF/DREB TFs undergo ABA-independent pathways and induces the stress gene expression. The two subgroups of DREB subfamily: DREB1 and DREB2 are induced by two different signal transduction pathways under low temperature and dehydration respectively. NAC/ ZF-HD (zinc-finger homeodomain) Regulon The NAC (NAM, ATAF and CUC) family is the plant specific TFs involves in development and physiological adaptation of plants in stress condition. 1. Agarwal, M., & Zhu, J. K. (2005). Integration of abiotic stress signaling pathways. Plant abiotic stress, 19, 215. 2. Lata, C., Muthamilarasan, M., & Prasad, M. (2015). 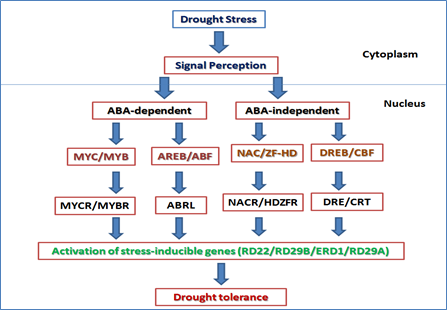 Drought stress responses and signal transduction in plants. In Elucidation of abiotic stress signaling in plants (pp. 195-225). Springer, New York, NY.